Today I have a card to share that features the largest butterfly in the set. I simply cut two patterned paper butterflies and two fabric ones, layered them up and stitched them together. I added them to some card which I die cut with the new stitched frame die from THIS awesome set, added a sentiment from Simon's Handwritten Greetings set, and splattered it with Hero Arts silver metallic spray. 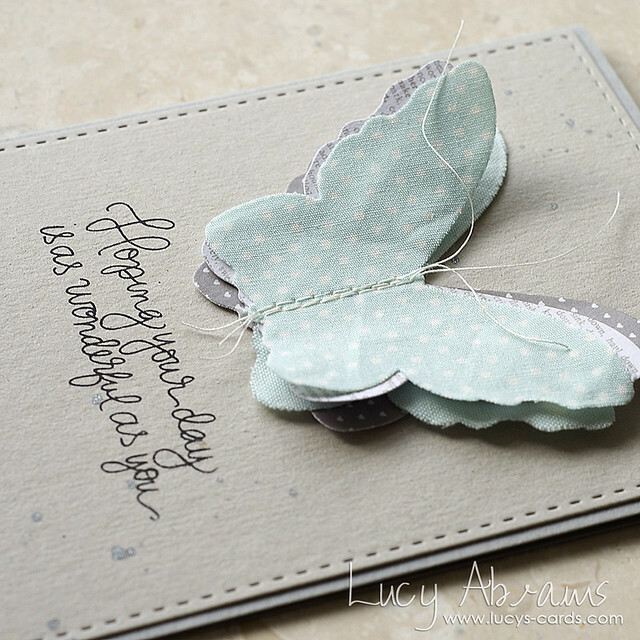 I haven't used fabric on a card for ages… LOVING the texture. :) And this new Hero Arts spray is FANTASTIC. Highly recommended. This is absolutely gorgeous! I love it! Saw this on instgram. After I picked my jaw up off the floor ran to the computer to get a closer look. Liked it even more than before. Gorgeous incredible layering. What a charming card Lucy! Love the layered butterfly!!! !